molded plasticcabinet measures7x21hx9inchesdeep. ULlieted. FromJ apan. 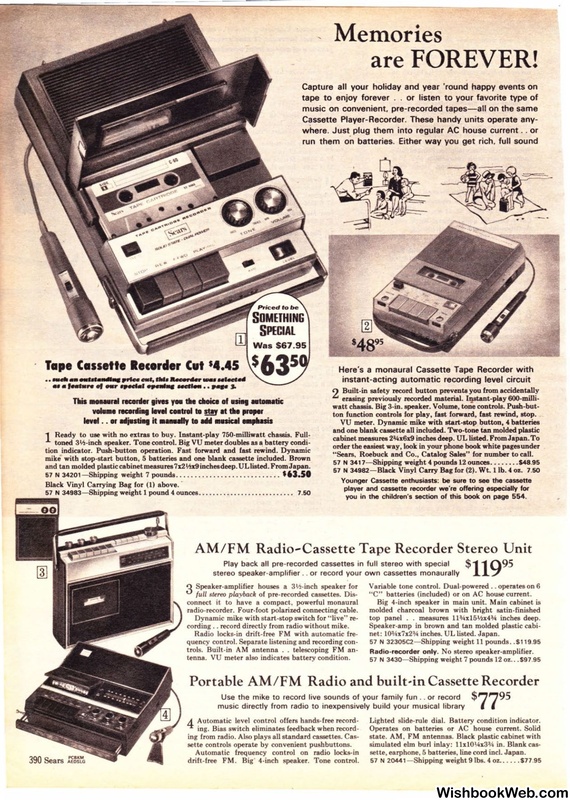 "Sears, Roebuck and Co., Catalog Sales" for number to call. 34201 -Shipping weight 7 pounds.... ... . . .... ... .. ..... . .. ..
"C" batteries (included) or on AC house current. net: 103Ax7x23A inches. UL listed. Japan. Radio-recorder only. No stereo speaker-amplifier. sette controls operate by convenient pushbuttons. drift-free FM. Big" 4-inch speaker. Tone control. Lighted slide-rule dial. Battery condition indicator. sette, earphone, 5 batteries, line cord incl. Japan.